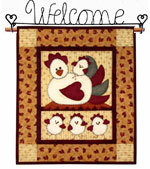 We have a new offer on our patchwork and quilting magazines. Take out a Subscription for any magazine and get a free back issue with your first magazine. You can choose from Australian Patchwork & Quilting, Country Threads, Handmade, Quilting Arts or Patchwork & Stitching for your free back issue. You are entitled to one free back issue with every subscription that you take out. We also have a number of patchwork and quilting magazines on back issue.